In this session, we have handpicked the best free lawyer WordPress themes for law firms, attorneys, legal adviser, consultant and or any other related kinds. As you are aware of the fact or not, there are hundreds of free law based WordPress themes in the web market. Picking one of them is a really a hard task. Even though we have been working in this field for years, sometimes it is hard for us to select the best one out. We have spent a good amount of time to search the best free WordPress themes that are relevant to topics so that we would give you the list of the excellent themes for your projects. Same goes with this session as well. As we all know that law and other law related professions are the most critical part of society. Whenever people have to work in this field, they seek for the best lawyers, law firms or let’s say legal advisers to sort out the problems. You shall need extensive measures and efforts to win the trust of the client. So one of the best ways to reach the people is to launch a law based website. So that, your clients could easily come to you whenever they need a lawyer. Creating a law website is not a big deal, but it must include the features that display the purpose of your work. How to create a law website? If this question is triggering you, then I want you to relax, kindly request you to spare some minutes and go through this article. As I haven’t only listed out the best free lawyer WordPress themes for law firms and attorneys, but also the things you need to know before creating a website. If you don’t know then let me tell you that the user interface and the functionality of the website are the two sides of the same coin. Trust me, if your website has both of these, within a few months, the traffic on your site will increase. What you need over here? Obviously, WordPress, because it is one of the most popular open source content management systems, that provides all the features and functionalities to create a healthy and professional website. And the best part, any newbie can easily configure the whole customization process of the theme with little or no coding experience at all. Not only that, it provides extensive features that take your website into the next level. Keep in mind that, not every WordPress theme provides every essential feature and on the top of that, free themes have fewer numbers of features and possibilities as a comparison with premium ones. 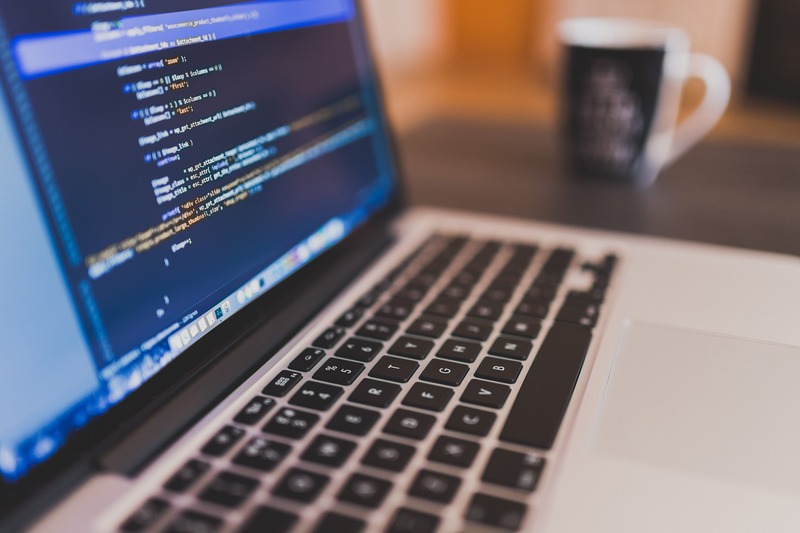 But it doesn’t mean you can’t create a site with these limited features and functionalities. There are some free WordPress themes which are performing better than premium ones. 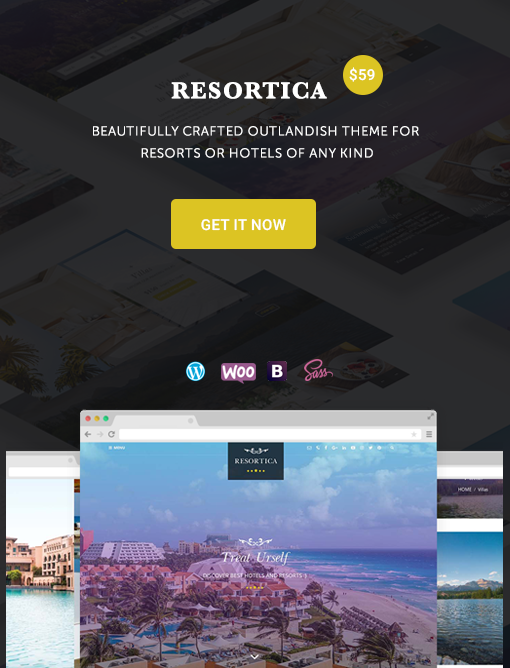 As I have already mentioned above WordPress offers hundreds of free themes for different niches in the web world. You need to be very careful while selecting the law WordPress themes as it must contain the features that show your work and services. It must contain law related features client section, team or attorneys profile, portfolio section, contact methods and so on that helps to interact with the visitors. Similarly, it must have a highly polished design to grab the attention of the visitors at the very first sight. Domain Name must reflect the purpose of your website. And, it should be simple, so that the visitors could easily memorize it. You can gain domain name suggestion from DomainsBot or Namemesh. It is a gateway to show your creativity to the public or world. It stores data of your website. SiteGround and Bluehost are the best web hosting services for WordPress. By now you have already acknowledged that there are so many things to consider before launching a law website. 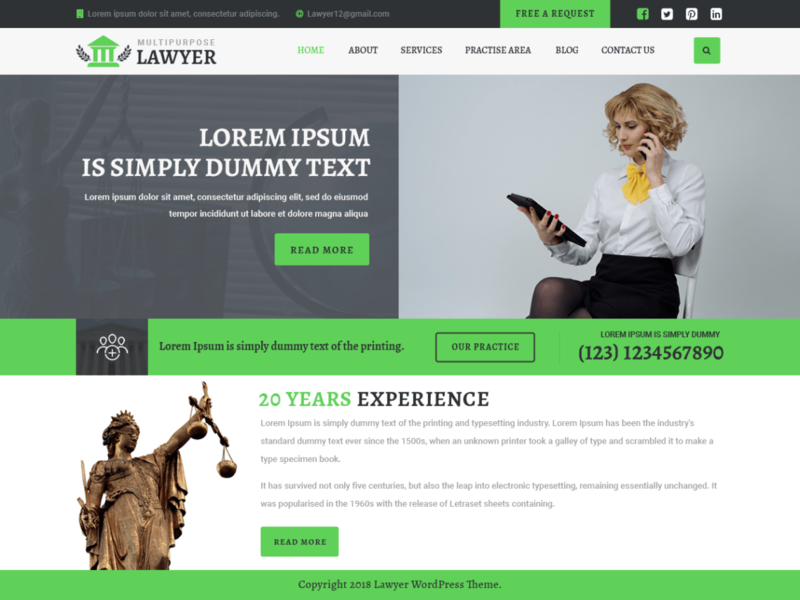 Without much further ado, let’s take a look at the free lawyer WordPress themes for law firms, attorneys, legal adviser, consultant, and so on. 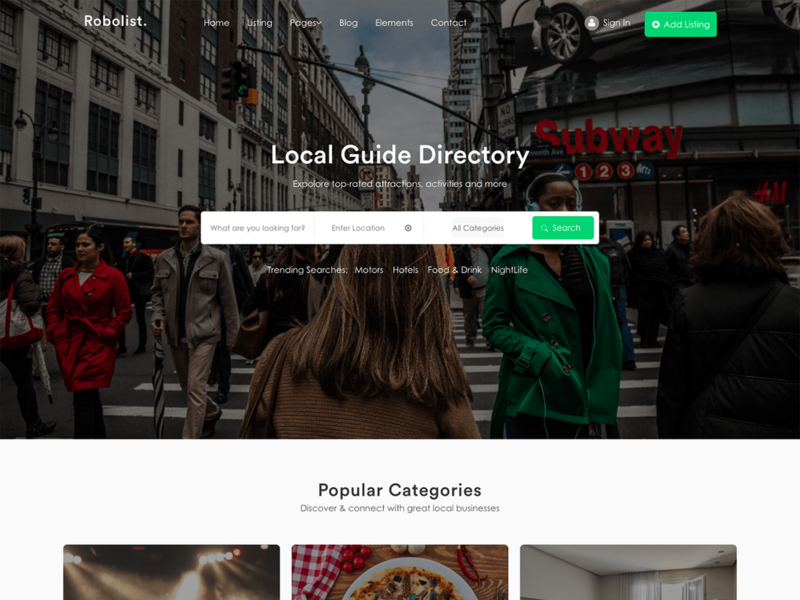 These themes are the result of the week-long research and include all the features that a law WordPress themes must have. Let’s take a look. 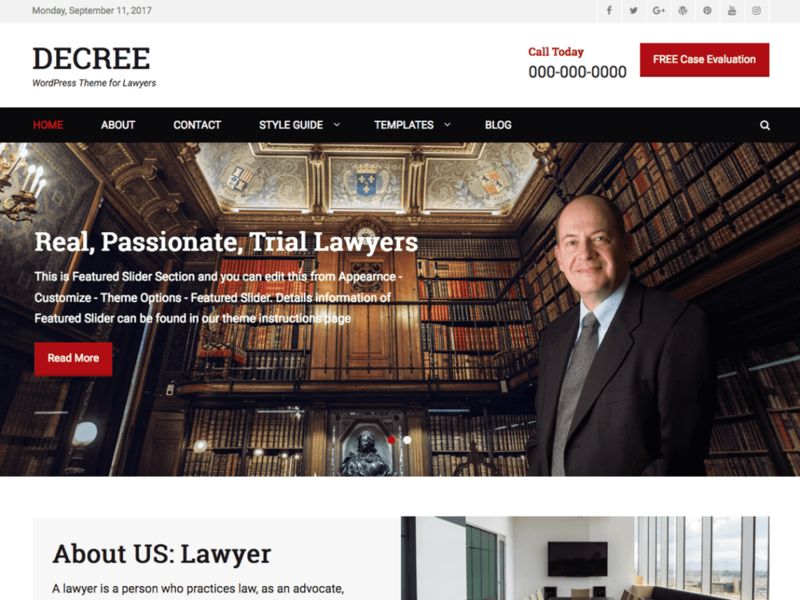 Lawyer Press lite is a free lawyer WordPress theme feasible for law firms, attorneys, legal office, adviser, and so on. With a secure and clean code, this theme is easily customizable. It supports the Elementor Page Builder Plugin. This means you can manage your site with just the drag and drop feature within a few minutes. It consists one-click demo importer helping you to simply import the demo for your site and add content. Features such as a call to action, call out section, call out section, custom widgets make it one of the best free lawyer WordPress theme. It is SEO friendly making your site one of the powerful search engine performers. 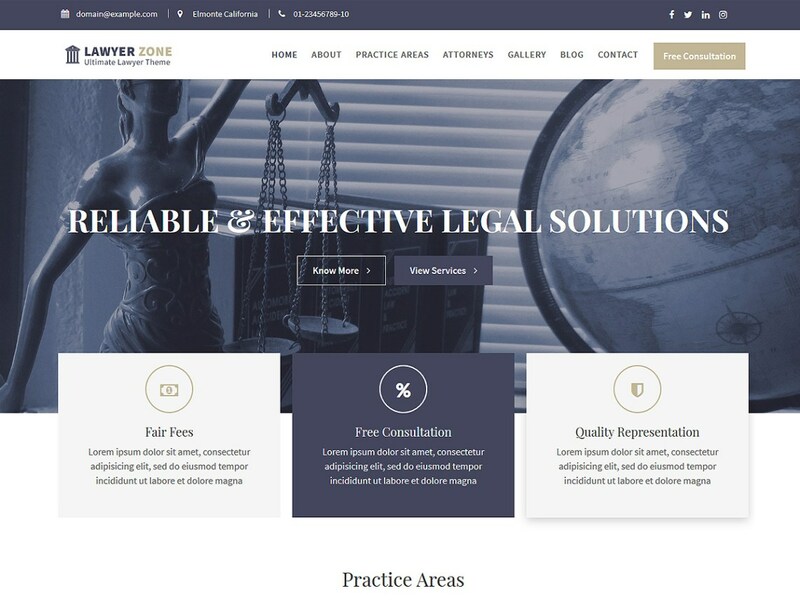 Lawyer Zone is one of the best free lawyer WordPress themes for law firms, legal advisors, business consultants, private attorneys, law teaching websites, businesses, agencies and corporations, having more than 1000+ active installations in WordPress.org. As the theme contains portfolio section, people like barristers, advocates, legal officers, and other law-related professions can also use it to showcase their work and services to the client. One of the best aspects, it is compatible with page builder plugin which allows you to create page layouts with its drag and drop functionality. With the deep integration of WooCommerce, you can also set this theme as an online store. 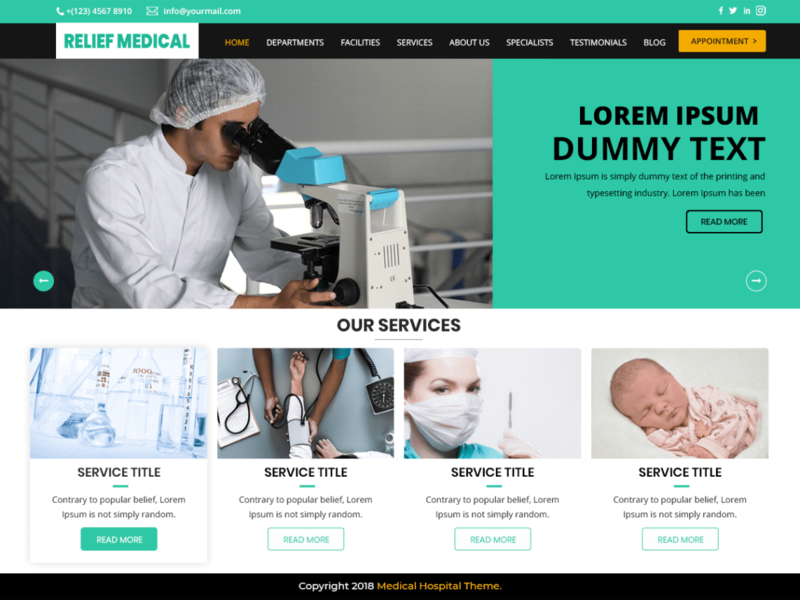 Having built in to serve the multipurpose functionality, you use this theme corporate, business education and medical sites as well. Features like Advanced Custom Widgets, Unlimited Slider, Social Media Integration, Custom Sidebar Areas etc. provide you the power to create a healthy and professional law website on your own. Legal Adviser Lite is simple and free WordPress themes for lawyers, law firms, legal counseling, solicitor, etc. 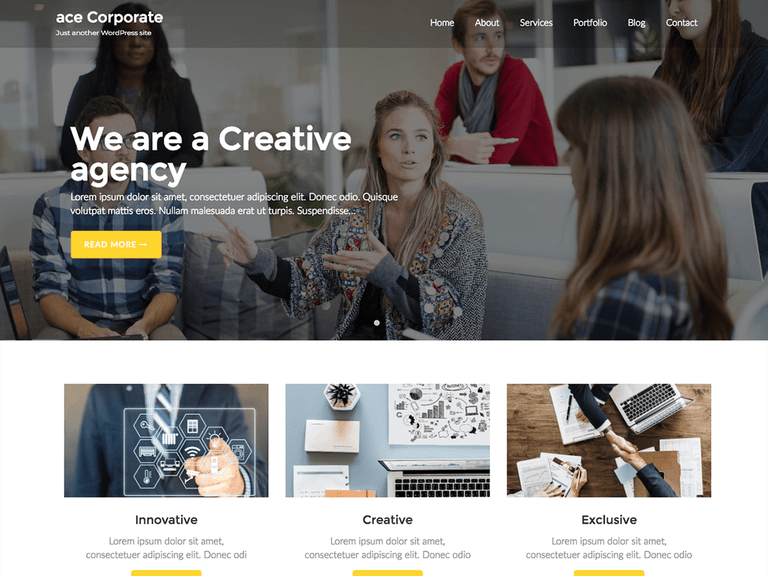 This theme also functions as multipurpose WordPress themes that work pretty amazing on websites for corporate, restaurants, hotel, photography, portfolio, blog, personal and multipurpose projects. Built in with the completely out of the box Nivo Slider, you can build a beautiful homepage, add images and show the information on the website. Further, it is fully responsive and works perfectly on any screen sizes and devices. This WordPress theme is also compatible with major plugins. 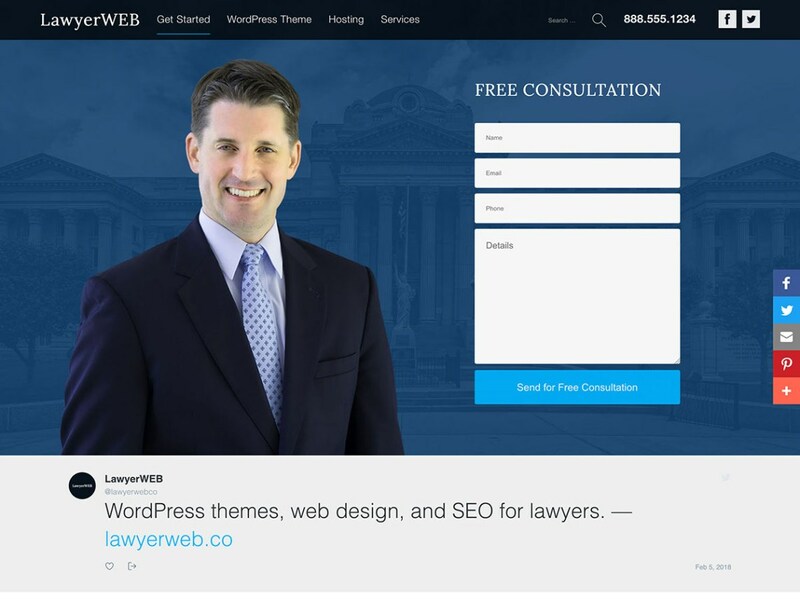 Lawyer WP is a feature rich and free lawyer WordPress themes for law firms, attorneys, that comes with the 2 custom menu areas, 3 custom widget areas, and 2 custom page templates. If you want to sell some legal based products, then make complete use of this theme as it is compatible with the WooCommerce plugin. 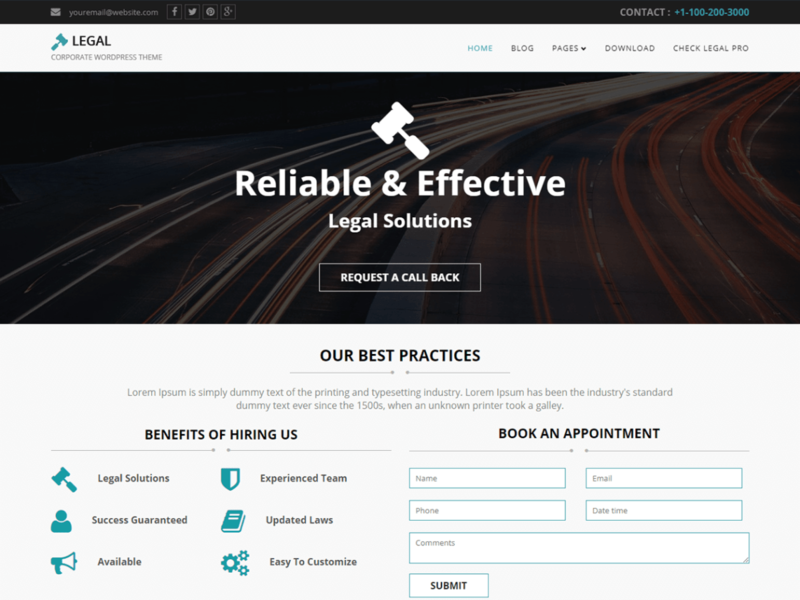 With a minimalist design and clean code, Lawyer WP takes your website into the next level. Not only that, this theme has followed all the on-site SEO practices which means it boosts the ranking of a website in Google Search Rank. 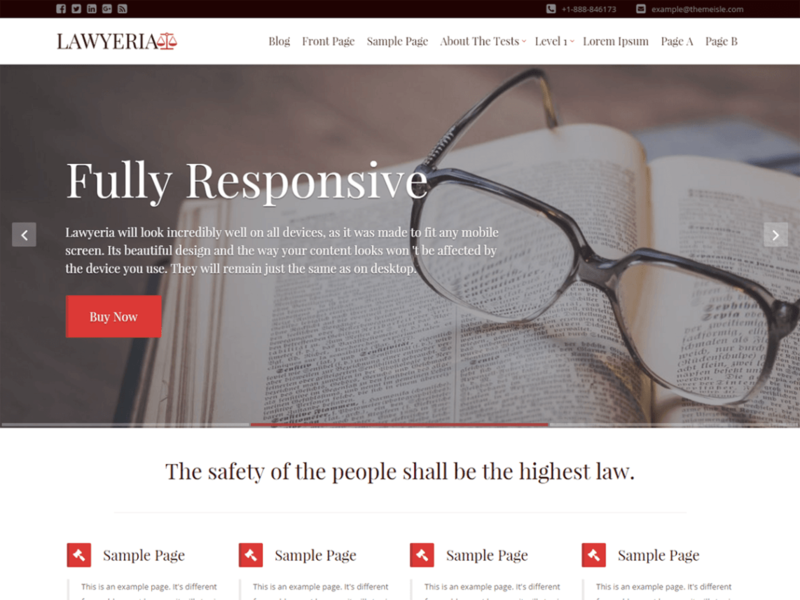 LawyeriaX Lite is free responsive lawyer WordPress themes for attorneys, law companies, legal firms, adviser and so on. It offers simple to use customization options that allow you to create a site the way you want to be. No need to have any coding knowledge. This free WordPress theme consists of a full-width beautiful slider, blog section, custom widgets, widgetized footer, live customizer, social links, customizable ribbon, custom logo, front page displays, and SEO friendly code. Legal is one of the best free lawyer WordPress themes having more than 1k active installation on WordPress.org. With a clean design and super flexible customization options, this theme enables you to build a professional and handsome law based website in a matter of minutes. Built in with Bootstrap Framework, Legal is fully responsive and adapts any viewing environment without any sizing error. Be it a law firm, attorney or business, personal website, this law based WordPress theme cope with all of them. Legal includes a feature like custom widgets, theme options etc. Decree is simple and feature-rich WordPress themes for lawyers, attorneys, law firms, legal counseller and any other similar to its kind. Packed with every essential features and functionality, this theme won’t let your law website down but instead helps to bring more clients to your page. Even though Decree is free lawyer WordPress theme, it comprises premium like features, having not to spend dollars if you not willing to. 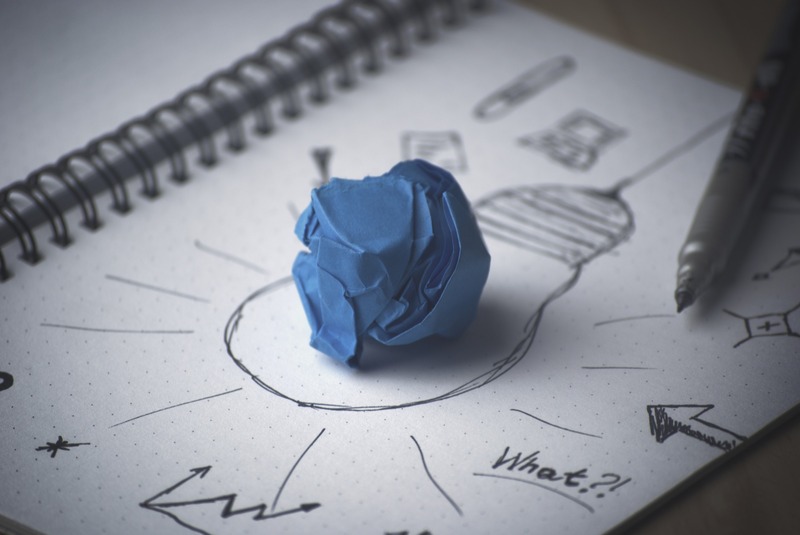 There are cleverly managed content blocks where you can show your services to the visitors. Likewise, it comes with the top header section and header right sidebar to add quick links and contact numbers, custom menu/widgets respectively. Not only these, but Decree also offers custom widgets, footer menu, featured slider page, portfolio, and much more. 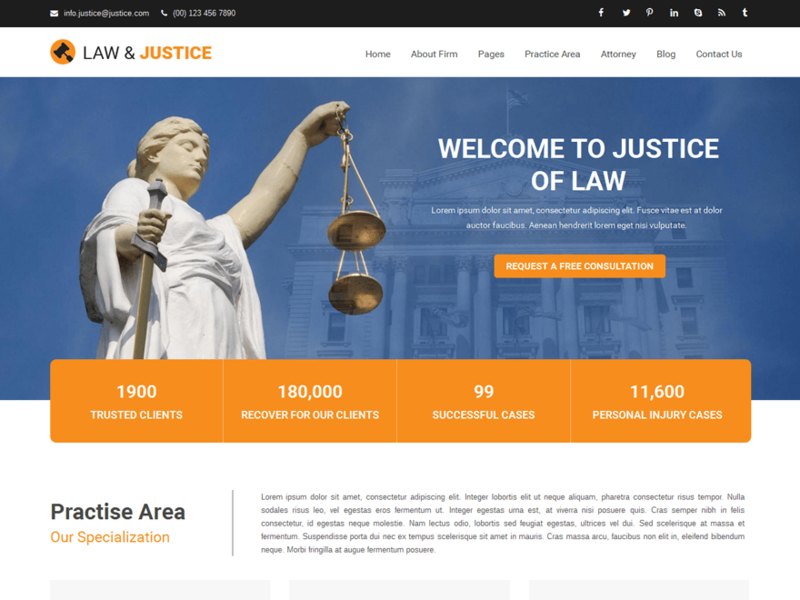 Justice is a simple and free lawyer WordPress theme for law companies, legal office, and attorneys. Besides, it is also suitable for corporate, blogging, photography, consultant, restaurant, cafe and other industries. The theme incorporates with WooCommerce, Jetpack, and Contact & plugin, providing you the extra functionalities to make your law website more powerful and professional. Apart from that, Justice has the modern, responsive and minimal design, that uplifts your website into the next level. Multipurpose Lawyer is a free lawyer WordPress theme that works perfectly with all types of law projects. It has full-width and full-screen homepage sliders that take your website design into the next level. The theme is fully responsive and works perfectly on any handheld devices. Likewise, it is compatible with all major browsers and won’t give you any designing issues. 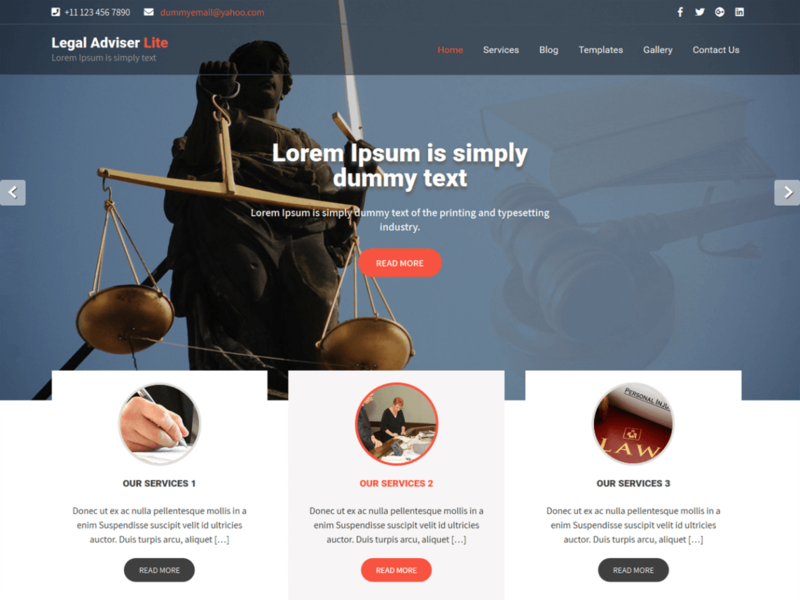 Multipurpose Lawyer theme is SEO friendly and can be translated into any language. So these are the list of free lawyer WordPress themes for lawyers, law firms, attorneys and any other legal projects. Pick any one them, I can assure that it will not disappoint you. Eventually, if you come across any relevant theme, then we would like you to mention it in the comment section.